The I-CAN! 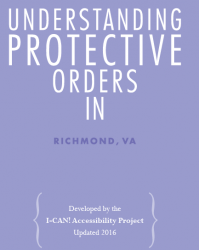 Understanding Protective Orders in Richmond, Virginia Booklet describes what a protective order is, the types of protective orders, the process of obtaining a protective order in Richmond, Virginia, tips about going to court, what to do after you receive a protective order, and various resources. Attached is (1) the English version of the booklet, (2) a large print English version of the booklet, and (3) a Spanish version of the booklet.